As Cobra moves into the final phase of the destruction of Nanzhao, Snake Eyes and Agent Helix are drawn in by Storm Shadow and the Arashikage. Arashikage clan ninja bearing the symbols of Cobra drop from above a bridge over the Ayeyardwaddy river in Nanzhao, landing with utter silence and slaughtering Norwegian United Nations troops before their foes could fire a single shot; most were killed with blades, some with arrows, and the rest with explosives. Come the next morning, Snake Eyes and his G.I. 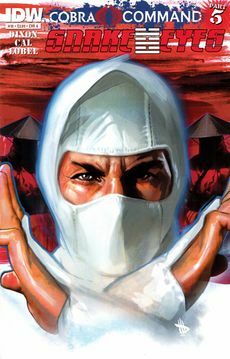 Joe investigate, with Agent Helix asking whether the Joe ninja recognises the arrows... and he does, because he saw them during to his fateful mission to Rangoon, where the Arashikage slaughtered his Joe teammates, and his former brother-in-arms Storm Shadow faced him in battle. Snake Eyes is snapped out of his reverie by Iceberg, who wants to report back to Joe command; but Helix has already recognised the situation for what it really is: a grudge match between Snake Eyes and the Arashikage, one that he won't back down from. Savane has good news for Cobra Commander: through burning, defoliants and the upcoming monsoon rains, the opium fields of Nanzhao have been ravaged; the Golden Triangle has been destroyed, Cobra has cornered the global drug trade, and the Commander's first campaign is a huge success. With global confusion over the morality of Cobra's actions, with some condemning them for the slaughter of UN troops and some praising them for bringing down the Nanzhaoese junta and destroying the poppy fields, everything has gone as Cobra Commander planned it; his business for the moment concluded, and Cobra out of the shadows, he enters his quarters to rest with an order to not be disturbed. However, there is someone waiting for him: Storm Shadow, who has been out doing the work of Cobra... though not under the Commander's orders. Cobra's leader recognises his true motivation — anger over his use of Zartan to trick Storm Shadow into aiding his ascension to the position of Commander — but, despite assuring Storm Shadow that the murder of Oda Satori was Zartan's doing rather than under his orders, he refuses to allow the ninja permission to kill the shapeshifter, still having use for him. Cobra Commander inquires what Storm Shadow has been doing to benefit Cobra while defying his orders, and the ninja's answer is simple: Snake Eyes. Snake Eyes contacts Scarlett, asking for coordinates of the Arashikage's headquarters. Scarlett is doubtful about her ability to find them, but when directed to check satellite images of the Da Zum Dam region of Kachin province, she quickly spots what she's looking for: an area of perfect clearings in the shape of the ninja clan's bagua trigram insignia. Armed with the coordinates, Snake Eyes drops from a helicopter piloted by Iceberg into the jungle below, despite the snow trooper's insistence that it's a trap; he is quickly followed by Helix, unwilling to listen to 'Berg's insistence that Snake Eyes doesn't want them around. On landing, Helix looks for Snake Eyes, but doesn't notice the Arashikage sneaking up on her; she is only saved from their throwing knives at the last moment by Snake Eyes, pulling her out of the way. The ninja-commando stalks off into the forest, and as Helix loses track of him once more, she comes to a conclusion: he knew she would follow her, and is using her to draw out the Arashikage, something proven when the ninja strike once more; though she takes out two, the third disarms her, and Snake has to rescue her. Helix surmises that they're headed to somewhere with a lot more of the ninja, and they soon come across it, somewhere that Helix recognises: the Temple of Bells. In the Fort Baxter mess, Mainframe goes over the facts of the Nanzhao invasion and the lack of an evident endgame: forcing mass emigration, but not into India or China; destroying the poppy fields but not the country's infrastructure. While Dial-Tone is more interested in what deal is having Cobra keep India and China out of the picture, Mainframe wants to know why they'd leave the highways and railways intact if they wanted to leave the country empty; and doesn't see how they intend to keep the nation depopulated without a military occupation force. But in Pthao in Nanzhao, the answer to that question is becoming clear, as Destro is overseeing Cobra's latest acquisition: six low-yield, but "extremely" dirty nuclear weapons, intended to make sure nobody returns to Nanzhao's empty cities! "Ever notice how Snake Eyes' personal life can always be defined as a vital mission?" "You set me out to draw fire. The last minute rescue does not make us even." Mainframe has a mug with an Autobot insignia on it, something that's a little more awkward following the establishment of the Hasbro Universe... though at least it's not a Decepticon logo. Cover A: Storm Shadow and the Arashikage, by Dave Wilkins. Cover B: Storm Shadow among the skyscrapers, by Robert Atkins and Simon Gough. Cover RI: Snake Eyes, by Tom Whalen. This page was last edited on 7 October 2017, at 22:34.